CarGurus has 22,236 nationwide Forester listings starting at $1,000. In the middle of the storm, when others were indoors, the Forester logged mile after mile without a fuss. Its all-wheel drive clawed through the snow and maintained control in just about any level of accumulation on the road. If you live in New England, Colorado or the Pacific Northwest, Subarus are common sights. Here in Massachusetts, they frequently line the frost-heaved and salt-worn streets. Subaru has focused on the advantages of its symmetrical all-wheel drive as long as anyone in the business, and its efforts have yielded a stellar reputation for all-weather driving capability. Through the tumultuous auto bailout years, Subaru was one of only two brands to post positive sales numbers. If you think the Toyota Camry has a loyal following, it's nothing compared to the the near cult-status of the Subaru lineup. The flagship of this lineup is the 2014 Subaru Forester. This high-riding wagon has capability and versatility that far exceed that of many other car-based crossovers. Through the years, the Forester has grown in size, but not to the same extent seen elsewhere in the industry. The Forester has largely stuck to the same formula that has made it such a popular midsize, 5-passenger crossover. However, Subaru may have kept the 2014 Forester too close to the formula, as this high-riding wagon feels dated at times. Subaru kept the general size and shape of the previous Forester for 2014 but upped its styling flair. In fact, the entire Subaru lineup has drifted toward a “Samurai” aesthetic. This is an obvious attempt to spread the appeal of the Forester to new buyers but risks alienating the core Forester buyer, who looks to Subaru for practicality and sensible styling. The look is aggressive, but the new Forester feels narrower and taller than it ever has, even though its 8.7 inches of ground clearance is 0.2 inches less than the previous version's. The base 2.5i trim starts at $21,995. 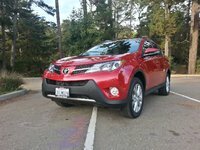 Our 2.5i Premium test version carried a base price of $23,495 and featured a massive sunroof and roof rails. The range-topping 2.0XT Touring starts at $32,995. The XT trims feature larger 18-inch wheels and a more aggressive front-end appearance. The aesthetic of the cabin is far more sedate than the exterior's, which can be a good thing. Too often, automakers saddle their vehicles with unnecessarily complicated radio and HVAC controls. The interior of the Forester is simple and straightforward, with a plain-old 3-dial setup for the climate controls. The steering wheel and instrument panel are sportier than may be required for a 5-passenger crossover. These elements look like they were pulled from Subaru’s performance-bred WRX parts bin and let the driver feel like he or she is operating a sportier vehicle, if only from the driver’s perspective. Crossovers of the Forester's size are typically offered with an efficiency-minded base engine and a more energetic performance version. 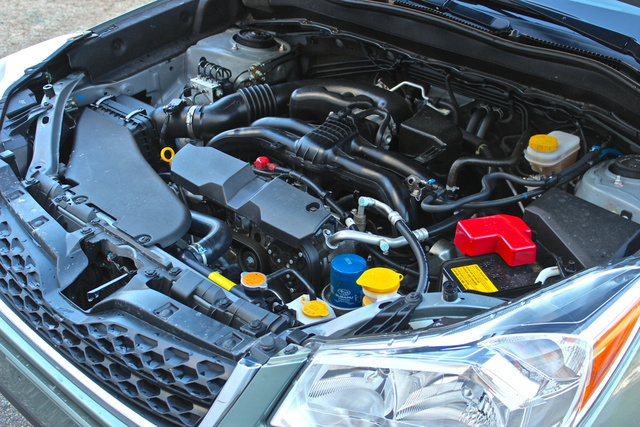 Foresters are designated by their engine displacement: 2.5i trims are fitted with a naturally aspirated 2.5-liter horizontally opposed or boxer 4-cylinder engine. This engine makes 170 horsepower and 174 lb-ft of torque. Power is sent through either a 6-speed manual or an available continuously variable transmission (CVT) to Subaru’s well-known symmetrical all-wheel drive. Aggressive acceleration is not a key concern with a vehicle of this nature, but Subaru still developed a formula that allows you to get up to highway speed with reasonable haste and out of trouble when you need it. The CVT has a “rubber band” effect, and as you lay into the gas pedal, it takes a moment for the CVT to locate the ideal ratio for acceleration. Subaru's symmetrical all-wheel drive confidently manages all manner of mud, sand and ice. Our week with the Forester was spent during two separate winter storms that each dumped more than a foot of the white stuff. All four wheels worked in unison, biting into the snow and ice. If you live in warmer climes and desire a more spirited drive, opt for a 2.0XT trim. They feature a turbocharged 2.0-liter boxer 4-cylinder making 250 hp and 258 lb-ft of torque. Power is sent to standard all-wheel drive via Subaru’s up-rated X-Mode handling system. Standard on 2.5i Limited, 2.5i Touring, 2.0XT Premium and 2.0XT Touring trims, X-Mode distributes torque more evenly in more inclement terrain. The Turbo XT trims return fuel economy of 23 mpg city/28 highway/25 combined. A 2.5i with a 6-speed manual will get 22/29/24, and our test model is rated at 24/32/27. In mixed driving my average was closer to 25 mpg. Frankly, I was not in love with this car before the snow came. But then, in the middle of the storm, when others were indoors, the Forester logged mile after mile without a fuss. Its all-wheel drive clawed through the snow and maintained control in just about any level of accumulation on the road. In rain, mud and snow, the Forester is as capable and composed as any rugged SUV that we have driven. The new Forester is 1.4 inches longer than its predecessor. It has a 1-inch longer wheelbase and is 0.6 inches wider. Regardless of whatever packaging improvements have been made with the 2014 Forester, it still feels somewhat tight when behind the driver’s seat. Perhaps this is a result of the fact that most cars have been growing a great deal generation to generation. The Forester has barely grown, and that defies our expectations. The 60/40 split-fold rear seats fold flat and also recline somewhat. 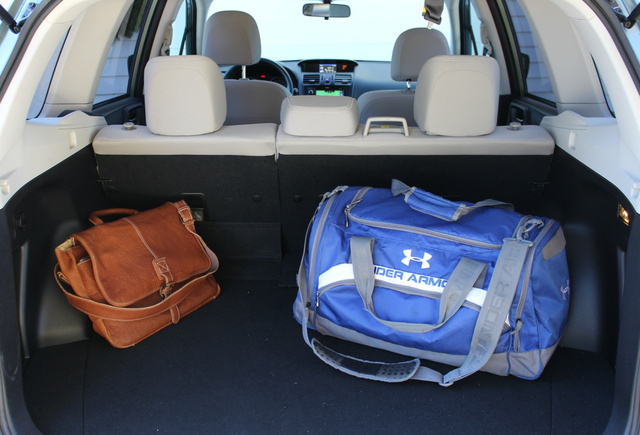 Combined with an added 3.7 inches of rear legroom, they should make long road trips in the back seat pass more quickly. Full-size adults will struggle in the back seat unless the front-seat passenger is kind enough to slide a good deal forward. For kids and families on the go, the size is just right. The lay-flat seats and generous headroom are an ideal combination for moving relatively large items. The Forester appears to be able to handle all manner of desks and medium-size bureaus. Rear space is deceivingly abundant. Not so impressive was the technology available in the Forester. In-car technology is part of what drives new-car sales. We like to talk about it, and buyers are looking for it when shopping. Customers are test-driving the tech as much as they are the car itself, and the tech simply is not there with the new Forester. 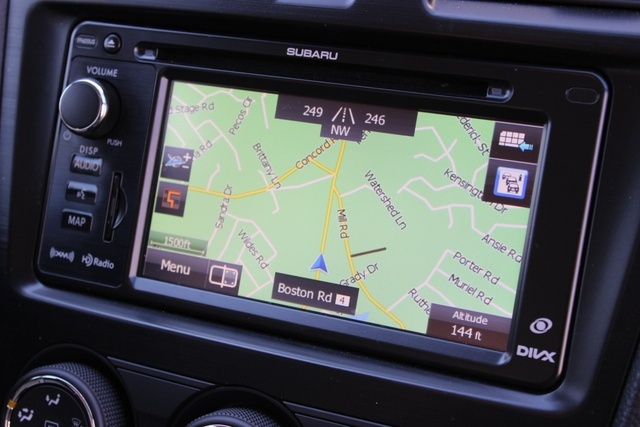 Our 2.5i Premium test model featured a touchscreen interface for the stereo and navigation systems. The touchscreen provides access to AM/FM/XM satellite radio as well as Bluetooth streaming audio from a paired smartphone, but it is not up to par for the 2014 car market. The automotive industry is aflutter with high-feature touchscreens in very common vehicles. Crossovers like the new Toyota RAV4 have vivid touchscreens with very sensible layouts. The screen in the Forester is evidently similar to an aftermarket-installed stereo, and the screen and the icons presented on it are far too small. It's very easy to hit the wrong icon on the screen, thus selecting AM instead of FM. Additionally, there's no manual input prompt for XM radio stations. With hundreds of channels, having to manually scroll through the channels is a time-consuming and distracting task. Many other cars have a number-pad menu that presents itself and allows the driver to manually enter Channel 52, without having to scroll up from Channel 9. Perhaps the most inexcusable element of the Forester’s suite of outdated technology is the poor microphone reception for placing calls. Take a quick jaunt through a Subaru owners' forum on the subject, and all complaints are the same: If you're trying to conduct a call while driving, the recipient hears more road noise than they do your voice. This forces drivers who are trying to be safe by using the hands-free mode to switch over to using the actual phone. Not only is this microphone disappointing, it’s not safe. The Forester may be new for the 2014 model year, but the technology is at least 5 years old, if not more. From the position of safety through control, the Forester is an incredibly safe vehicle. All the airbags in the world are moot if a vehicle has poor traction in rain, ice and snow. The fact that the Forester is so competent in these elements adds to the value of its 7 standard airbags and reinforced safety structure. Features like vehicle dynamics control, antilock brakes and electronic brakeforce distribution add to the on-road competence of the Forester. 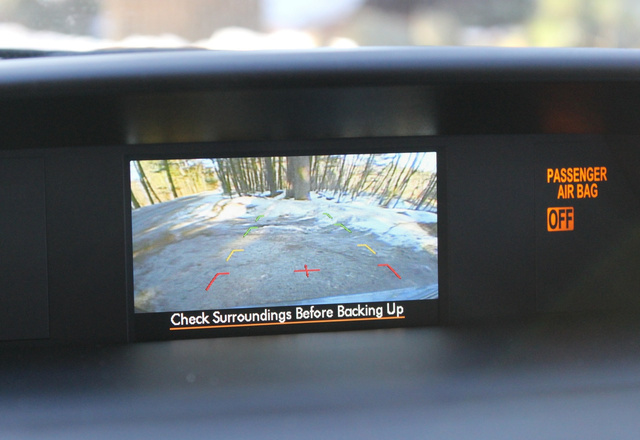 These systems are joined by the optional Subaru EyeSight feature, which consists of cameras and sensors to let you know when you veer outside your lane or if a crash is imminent. It's a truly effective system, but it is part of an option package for most trims. The 2014 Forester is a fine vehicle, but the tragic irony of its redesign is that it was an ideal crossover in 2013, with an outward appearance that was far more in tune with the sensibility of Subaru buyers. The only area that really needed improvement was the in-car tech, and Subaru dropped that ball in a big way. But then you look at the price and can start to forgive the Forester. A crossover that averages 25 mpg in combined driving, can trudge through all manner of snow and ice and has plenty of standard features (including a massive sunroof, navigation and heated front seats) comes in at $27,420. It's hard to argue with a vehicle that is as truly useful and capable as this for the price. Younger buyers may not approve of the tech level, but if snow falls where you live, there are few vehicles as capable as the 2014 Subaru Forester. 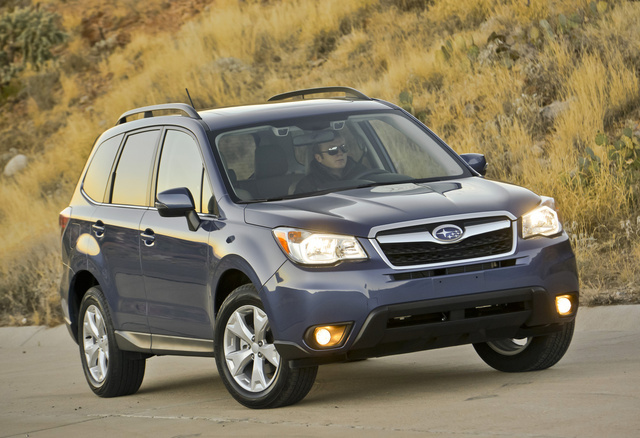 What's your take on the 2014 Subaru Forester? Rearspring At 11,230 miles the back springs broke. The car was only driven on paved streets. Users ranked 2014 Subaru Forester against other cars which they drove/owned. Each ranking was based on 9 categories. Here is the summary of top rankings. 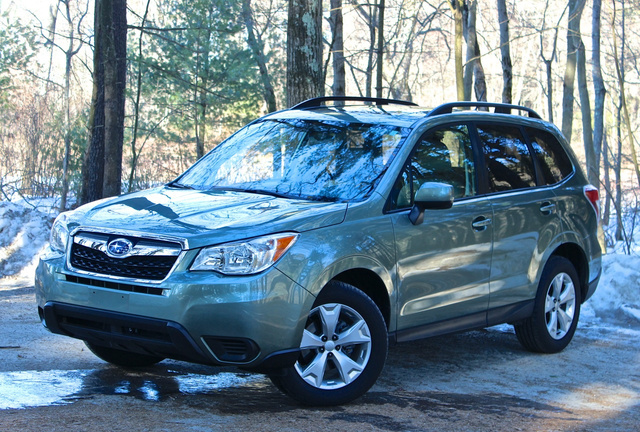 Have you driven a 2014 Subaru Forester? I need to replace my 2014 subaru Forester's battery. Do I have to use a Subaru product or will a different brand work?